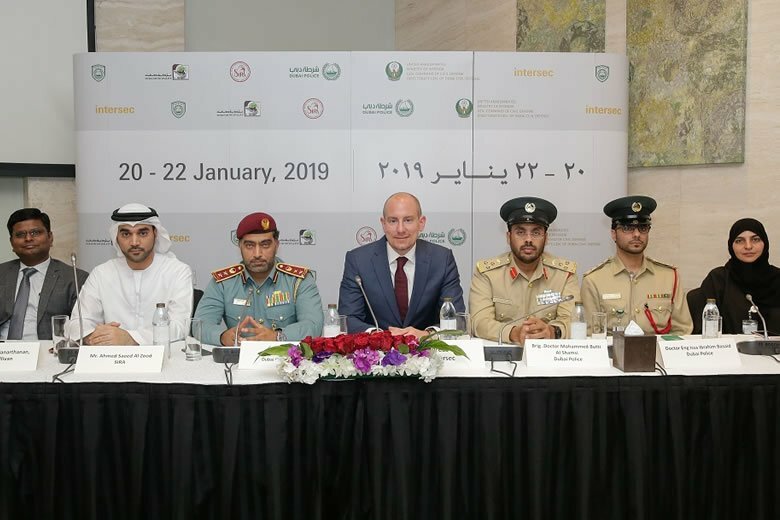 Dubai, UAE: Live-action firefighting and emergency rescue operations, drone demonstrations, and a revamped conference discussing Artificial Intelligence, safety planning for cities of the future, and securing the Dubai Expo 2020, are some key features of Intersec 2019, as the final preparations are laid ahead of its big opening in Dubai next week. The 21st edition of the world’s leading trade for security, safety, and fire protection takes place from 20-22 January 2019, with more than 1,200 exhibitors from 54 countries spanning 60,000sqm at the Dubai International Convention and Exhibition Centre. The annual three-day event is organised by Messe Frankfurt Middle East, and supported by the Dubai Police, Dubai Police Academy, Dubai Civil Defence, the Security Industry Regulatory Agency (SIRA), and the Dubai Municipality, along with a further 35 international government partners, trade associations, and non-profit institutions aimed at advancing the global security, safety, and fire protection landscape. The key government partners and organiser also addressed media at the show’s official press conference today (16th January), presenting the latest developments in protecting life and assets in a Middle East market where demand for security, safety, and fire protection products and solutions will continue to climb. According to analysts 6WResearch, the Middle East market for physical and perimeter security, commercial and information security, fire protection, and drones, is currently worth a combined US$14.5 billion. This is estimated to grow at a compound annual growth rate of 13.5 percent over the next six years, valuing US$31 billion in 2024. Physical, perimeter, and commercial security, comprising monitoring and surveillance systems, restricted entry systems, access control, intrusion detection, and perimeter security, holds the lion’s share of the market, valuing US$10.8 billion in 2018, and estimated to more than double in value over the next six years to be worth US$23 billion by 2024. Saudi Arabia and the UAE are the key contributors, currently comprising nearly 60 percent of the market for physical, perimeter, and commercial security (US$6.48 billion), on account of favourable government regulations, infrastructure development, and adoption of new technologies across industry verticals such as retail, hospitality, banking, aviation, transport, oil & gas, and construction. The Middle East fire safety systems and equipment market will also increase by eight percent annually says 6WResearch, valuing US$3 billion in 2024, from an estimated US$1.9 billion in 2018. The markets for information security (from US$1.4 billion in 2018 to US$2.7 billion in 2024), and drones (US$510 million to US$2.4 billion), are also in-line for solid growth. Andreas Rex, Intersec’s Show Director, said visitors to Intersec 2019 can see the latest in advanced technologies and solutions that are the future of a smarter, safer, and more secure world. “With 15 country pavilions, six dedicated show sections, seminars and workshops, live demonstration areas, countless product launches, and nearly two-thirds of the world’s top 50 security manufacturers on-board, Intersec 2019 is the major annual gathering for thousands of industry professionals eager to start 2019 on a positive note,” said Rex. “The new Intersec Future Security Summit is our most comprehensive conference programme yet bringing together more than 40 regional and international experts and government speakers. Here, Artificial Intelligence in video analytics, future foresight on security, emergency preparedness and response, and planning the security for the Dubai Expo 2020 are among the many topics that will be presented. “Another new feature is the Safety Forum in Hall 8, highlighting challenges within the Middle Eastern health and safety industry and the benefits of adapting to international safety standards. From cloud-based advanced video analytics to integrated smart city technologies, or the world’s top fire-service vehicles and high-rise firefighting lifts, Intersec 2019 will put the spotlight on the latest global solutions that are moving the needle in keeping our societies safe and secure,” Rex said. Colonel Expert Ali Hassan Al Mutawa, Assistant Director General for Protection and Safety at the Dubai Civil Defence, also spoke today about the authority’s plans for Intersec: “The Dubai Civil Defence has been providing a number of solutions and innovations in the field of safety and fire protection, which has led to increased efficiency and effectiveness of services provided in the fire and rescue operations,” said Al Mutawa. “At the 21st edition of Intersec, we’ll present the Emirates Fire Safety Laboratory, the first of its kind in the Middle East, through which we plan to raise the level of safety and the quality of fire safety systems through the services we provide. The largest of Intersec’s six show sections is Fire & Rescue, with 431 exhibitors in 2019. This is followed by Commercial Security (375 exhibitors), Safety & Health (142 exhibitors), Information Security (120 exhibitors), Homeland Security & Policing (90 exhibitors), and Physical and Perimeter Security (54 exhibitors). The 15 country pavilions are coming from Canada, China, Czech Republic, France, Germany, Hong Kong, India, Italy, Korea, Pakistan, Russia, Singapore, Taiwan, UK, and the USA. With 83 percent international participation, some of Intersec’s most notable country growth has come from Saudi Arabia, which covers 41 percent more exhibition space in 2019 (211sqm) compared to 2018. Other growth countries include Spain, which occupies 47 percent more space this year (589sqm); Canada (466sqm, 35 percent y-o-y increase), France (386sqm, 19 percent increase); Lebanon (183sqm, 101 percent increase), and Austria (190sqm, 43 percent increase). UAE participation meanwhile remains strong, with 162 exhibitors covering 10,000sqm of exhibition space. Other conference highlights at Intersec 2019 include the one-day Intersec Fire Conference on 21st January, which will provide insights into the changing global trends in fire protection and its implications on the Middle East, while Dubai’s Security Industry Regulatory Agency (SIRA) Forum on 22nd January will also return with the latest updates in security law and industry regulations in Dubai. Returning popular features include the Drone Zone, an Outdoor Demo Area, and the Safety Design in Buildings Pavilion. Intersec is held under the patronage of His Highness Sheikh Mansoor bin Mohammed bin Rashid Al Maktoum.